Arrival at Cairo airport. You will be welcomed by our Kasha staff who will meet and assist you. Check in the hotel and over night. Wake up call and buffet breakfast. Proceed to visit the Egyptian museum. Have lunch. In the afternoon, shopping at Khan EL Khalili Bazar. Back to hotel and overnight. Wake up call and buffet breakfast. Transfer to the airport to take a short flight to Luxor (appr. 1 hr.). Arrive Luxor airport, then transfer with the guide to the Nile Cruise for check in, lunch on board. In the afternoon, you will visit the East Bank of Luxor and Karnak temples. Dinner and overnight abroad the ship. After breakfast, proceed to visit the West Bank (Colossi of Memnon, the temple of Hatshepsut, Valley of the Kings). Lunch on board. In the afternoon sail to Esna. Dinner and overnight on board in Esna. Breakfast on board. The ship will sail to Edfu where you will take a tour to visit the temple dedicated to the God Horus. Return to the cruise for lunch. Sail to Kom Ombo and overnight in Kom Ombo. After breakfast. Proceed to visit the huge temple of Komombo. After the tour you will return onboard to sail to Aswan. Lunch on board. In Aswan you will visit the High Dam and Philae temple. Dinner and overnight on board in Aswan. After breakfast, take a tour by felucca boat and visit the Botanical Garden. Transfer to Aswan airport to fly to Cairo. 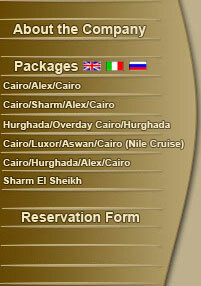 Meet and assist at Cairo airport then transfer to your hotel and overnight. Wake up call and buffet breakfast. Transfer to Cairo International airport for final departure.